I have a confession: this was a freezer meal. 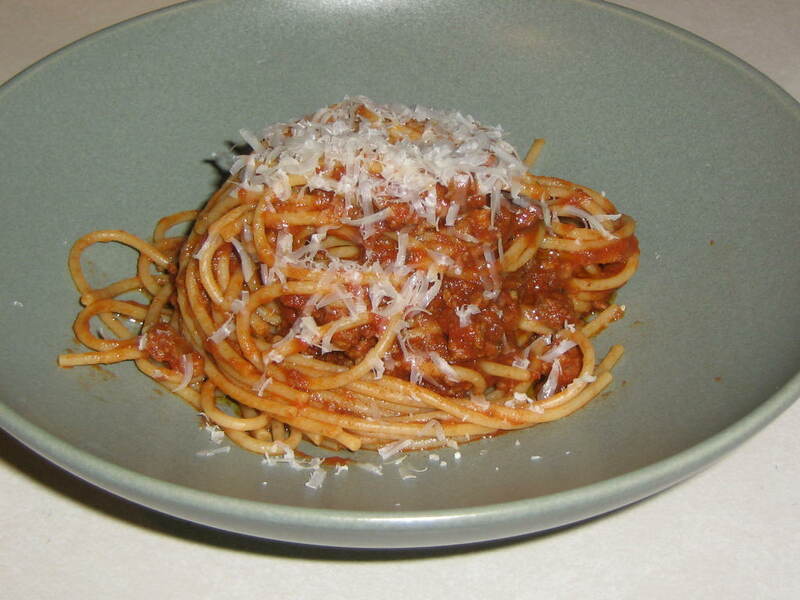 You see, I’ve been really wanting to make Anne Burrell’s Bolognese again (and boy, do I have a story to go with that dish – stay tuned), but I had some meat & mushroom sauce in my freezer that I really had to use first. This is another one of my very own recipes that isn’t really a recipe, it’s just something that I cook. However, the last time I made it, I happened to write down exactly what I did. And, it freezes beautifully, so when you have a night like I did last night, where you simply don’t want to cook (there’s that dishes thing again) but know you should, you can whip up a meal in minutes. Here’s a recipe for the sauce, as well as reheating instructions. Heat about a tablespoon of olive oil over medium-high heat in a dutch oven. Add diced onion and cook until translucent, about 5-8 minutes. Season very lightly with salt and pepper. Add beef (season the beef with a little salt and pepper), and let it brown. (The better the browning you get at this point in the cooking process, the better the flavor will be in the finished product.) Add tomato paste and allow to brown. Add the mushrooms and cook until they release their juices. Add garlic and cook until fragrant. Deglaze the pan with the wine. Add the crushed tomatoes and bay leaves. Cover and simmer over low heat for 30 minutes, taste. If needed, add salt and pepper. Simmer for another 30 minutes and taste again and adjust the seasonings. Add the basil and allow to cook for a few more minutes. During this time, if the sauce becomes too thick, add a cup of water, cover the sauce and let it simmer away again (you may repeat this process a couple of times). This allows the flavors to develop, and your sauce will have a richer, rounder flavor as a result. Remove the bay leaves and serve the sauce over cooked pasta with freshly grated parmesan. If desired, garnish with chopped basil or parsley. Okay, so there’s the recipe. Now, if you’ve frozen some of it for quick leftovers (or portioned off and froze all of it for dinners during the week), here’s what you do. First, place the dish of frozen sauce in a bowl of very hot water. The goal here is to soften the edge of the frozen sauce block just enough so you can get it out of the container and into a small saucepan. Once you’re able to do that, cover the saucepan and heat over low heat. It will heat through rather quickly at this point. Meanwhile, bring your water to a boil for your pasta (whatever kind you like, I happened to use whole wheat spaghetti). I always add a drizzle of olive oil to my pasta water so I don’t have to deal with that icky (did I actually say icky?) foam that builds up on top. I also add a generous amount of salt to season the water. (Of course, the amount of pasta you use will depend on how much sauce you froze; I had enough sauce for two servings, so I used two servings of pasta – a kitchen scale works wonders in measuring that out). Boil the pasta for 2 minutes short of the minimum cooking time. 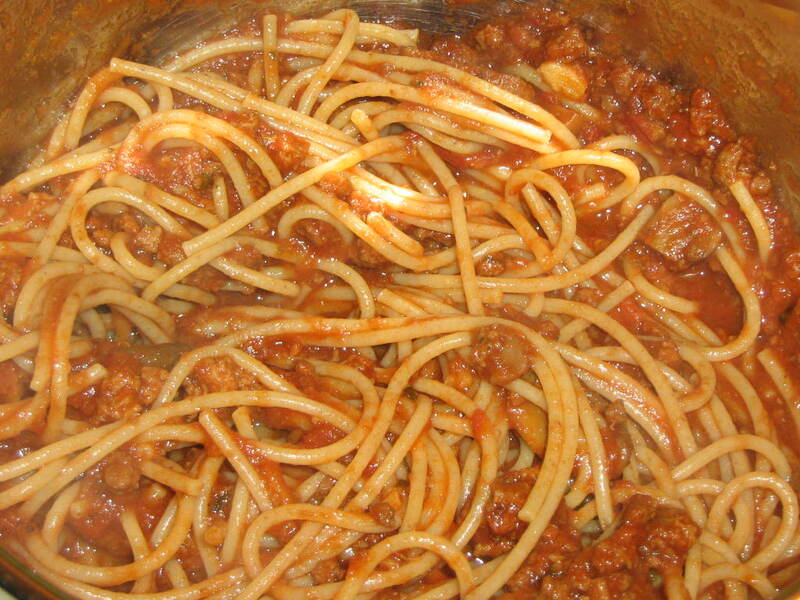 Using a tongs or spider, add pasta to sauce mixture to finish cooking. Add a ladel of pasta water. Cook mixture of low heat until the noodles absorb the pasta water and some of the sauce mixture. You may need to add another ladel of pasta water if you’re using whole wheat noodles. Plate the pasta and add grated parmesan, if you like (a must in my house), and perhaps a sprinkling of chopped parsley or basil. And there you go – dinner with minimum fuss and dishes, that tastes like you spent hours in the kitchen! This would be great served with a simple salad dressed with oil and vinegar.